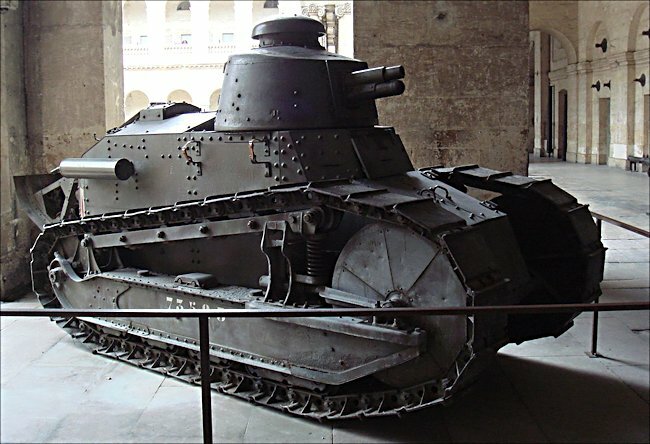 This French Renault FT 17 Tank can be found at the Musée de l'Armée (Army Museum) located in the Hôtel National des Invalides, 129 rue de Grenelle, 75007 Paris. Over the years it has been moved to different locations. The French word "Char" translated means tank. The number 17, referring to its 1917 in active service date, was added after the war. Rear view of the WW1 French Renault FT 17 Char Canon Tank's metal sledge blade designed to help it cross trenches. The early French tanks, the Schneider and the St Chamond were not very successful compared to the British WW1 early tank designs. The British had shown that tanks can break through enemy lines but once that had been achieved the there was a need for a ‘chaser’ tank. The big heavy Mark IV tanks were too slow for this role. This demand lead to the introduction of the Renault FT. I remember the initials as standing for First Tank FT, because in reality the Renault FT was the first modern tank to have a 360 revolving turret. It was designed as a cheap, easily produced machine gun carrier that only weighed 6 tons. It would be able to provide direct machine gun fire support for the infantry in an attack. Its weight meant that it would be able to cross most European river bridges. There had been a problem during the Battle for Cambrai break out when a British Mark IV tank had fallen into the river when the bridge it was trying to cross could not take the weight and collapsed. Nicknamed the ‘Mosquito’, the Renault FT tank could be deployed by being loaded onto the back of a truck and driven quickly by road to where it was most needed. 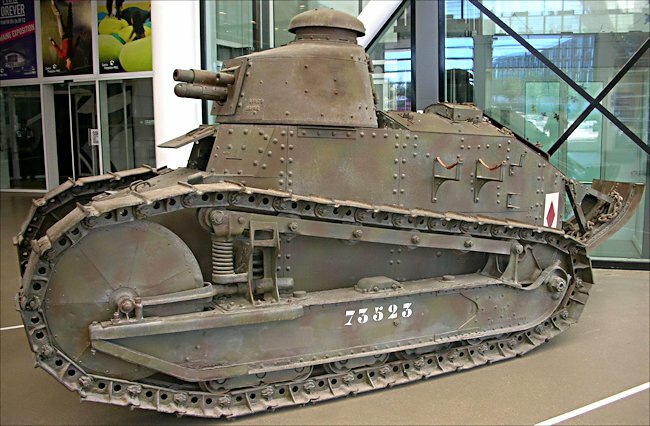 French tank driver William Roche recalled, "The infantry loved the little Renault FT tank. Despite being light it gave you a feeling you were invincible because you could hear the bullets hitting the side of your tank. If you had an especially tough machine-gun nest that was going to take a lot of infantry lives to storm, you could run right on up to it just like you were thumbing your nose at it. The tank went safely through the wire enabling us to go right up to it and shoot right in there and clean them out." With its fully revolving turret, raised superstructure on tracks and engine in the rear, this two man tank could be built cheaply and in very large numbers. Production ran at 75 tanks per week in the Summer of 1918, by the 11th November 1918 Armistice 3,000 Renault FT tanks had been built. Some turrets were fitted with the 37mm Puteaux SA18 short-barreled Gun whilst the majority carried a Hotchkiss 8mm M1914 machine gun. The American Army were loaned 144 French two man Renault FT tanks on arrival in France. American industry built 950 copies of the FT under a Licensing agreement called the M1917. The first American produced tanks were strongly influenced by their experiences driving this tank. This tank was still being used by a number of Armies at the outbreak of WW2. At the time of the 1940 Battle of France the French Army still had 8 battalions equipped with 63 Renault FTs each and three independent companies with 10 each. This was crazy. They were using a 22 year old obsolete tank. They had 534 FTs and they were all the machine gun only version. Poland had not been able to afford an ambitious military modernisation program in 1936 when Germany started to flex its military muscle. France agreed to lend Poland armoured vehicles and provided a loan to pay for them. Only 53 Renault FT tanks, now fitted with a 37mm gun, had been delivered by the time of the German invasion of Poland. Germany had 3,200 modern tanks armed and ready to fight against Poland’s 600 aged tanks. The Poles did not have a chance. 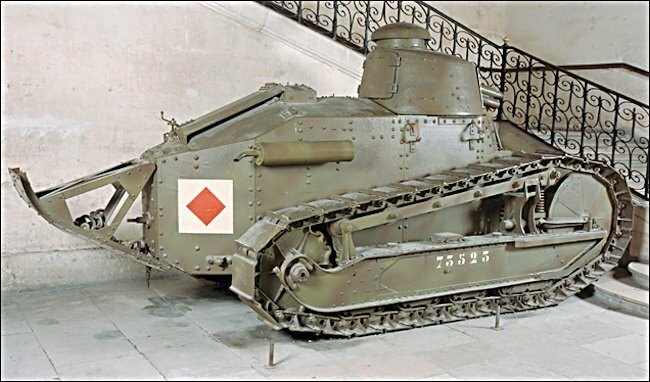 It was only after WW1 that the tank was given the prefix 17 to indicate the date in which it was designed 1917 to comply with future French Army tank naming system.